Tyshame Reid is about to start his first full-time job next month. 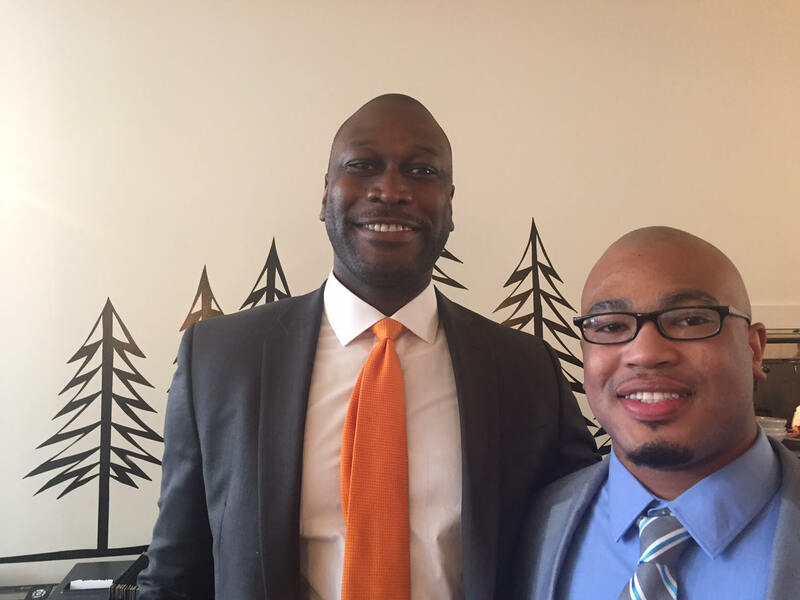 With support from Red Hook Initiative’s (RHI’s) Young Adult program, Tyshame secured a position as a Credit Analyst at the New York Business Development Corporation (NYBDC), a longtime supporter of RHI. Eight years ago, when Tyshame was in ninth grade, he took home his first paycheck from RHI. As a high school participant, Tyshame got what he calls “a second chance” by taking on a number of different jobs at RHI after school, including Office Assistant, Peer Health Educator, Teen Chef Facilitator, and Radio Intern. The support he received year-round at RHI from an early age enabled Tyshame to graduate college at the same time he aged out of foster care. 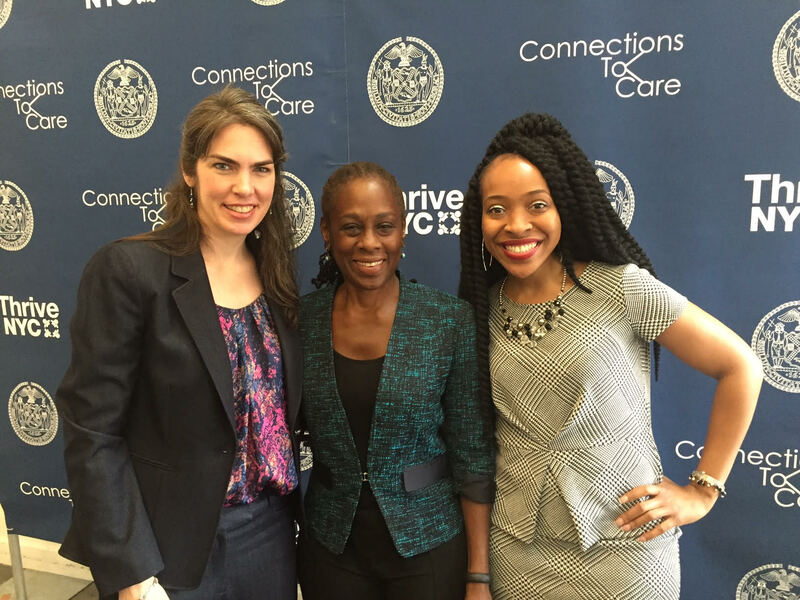 RHI Founder and Executive Director Jill Eisenhard, First Lady Chirlane McCray and RHI Social Work Coordinator Tanya Wilson. For hundreds of young people in Red Hook, accessing comprehensive mental health care is a significant challenge. 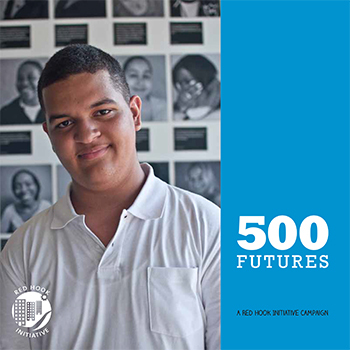 With new funding from the Mayor’s Fund to Advance New York City, Red Hook Initiative (RHI) will address this challenge by expanding counseling and mental health services for youth. First Lady and Mayor’s Fund Board Chair Chirlane McCray held a press conference at RHI last week to announce the Connections to Care grant, which was awarded to RHI and thirteen other organizations in New York City. Through a partnership with NYU Lutheran Family Health Centers, RHI staff will soon be able to identify teens and young adults with mental health concerns, provide appropriate support, and if needed, connect them to more acute mental health care before a crisis emerges. RHI’s Social Work Coordinator, Tanya Wilson, understands the community’s need for long-term mental health care firsthand. Tanya, who grew up in NYCHA’s Red Hook Houses, spoke on RHI’s behalf at the press conference. Tanya expressed gratitude for the opportunity to expand mental health services: “Young people show up here every day. 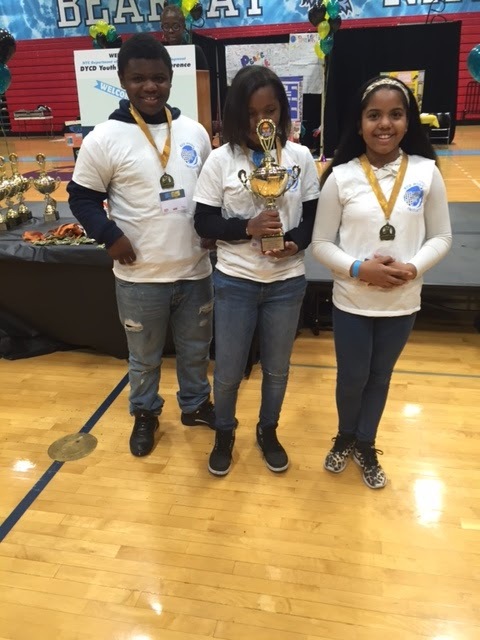 The desire and motivation they have to build a healthier sense of self and well-being is truly inspirational.” First Lady Chirlane McCray reflected on the importance of making the announcement at RHI, observing that, “Every day, the Red Hook Initiative serves young men and women, many of whom are clearly suffering from a mental health condition – and RHI has been without the resources to help their clients reach their full potential.” We are proud to be a partner in this initiative and look forward to serving more youth who already know and trust the staff at RHI. Read more in the Brooklyn Daily Eagle about the press conference and how Connections to Care will impact Red Hook.